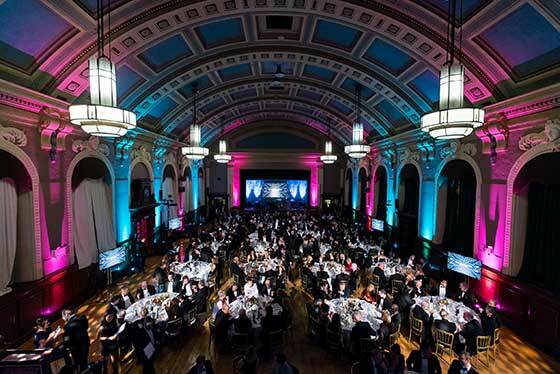 Mersey Maritime, a maritime cluster representing more than 1,700 businesses in the North West, is proud to announce the winners of its inaugural Industry Awards which were held at a black tie event at Wallasey Town Hall on the Wirral. One of the key awards was Mersey Maritime's own award highlighting its role in supporting small to medium-sized businesses through its Maritime Sector Development Programme. The programme is part-funded by the European Regional Development Fund. The SME (Small to Medium-Sized Enterprise) of Year Award was presented by Ramon van Barneveld of the Directorate-General for Maritime Affairs and Fisheries (DG MARE) based in Brussels. The award for Ambassador of the Year was decided by an independent judging panel who were unanimous in choosing Jim Teasdale, Chief Executive of Mersey Maritime Group, as their first recipient of the award. The award came as a complete surprise to Mr Teasdale who has successfully overcome serious illness in recent months and was at the dinner to mark his return to good health. Describing the inaugural Industry Awards as an opportunity to showcase the breadth and diversity of the maritime industry, Chris Shirling-Rooke, Acting CEO of Mersey Maritime, said: "The Mersey Maritime Industry Awards were every bit as successful as we had hoped. We were overwhelmed with the support but also at the number of award submissions which clearly indicates the importance of these awards. The maritime industry, including MP John Hayes, the UK Shipping Minister, has wholeheartedly supported the Awards which has been fantastic." Key guests within the maritime sector included Esther McVey MP, Minister of State for Employment; Sir Michael Bibby, MD of Bibby Line Group; John Syvret CBE, CEO of Cammell Laird Group; Mark Whitworth, CEO of Peel Group and the Mayor of Wirral Steve Foulkes. Mersey Maritime's Industry Awards, aside from supporting the North West maritime industry, helped raise over £1,300 for the Fairbridge charity programme. Fairbridge is an individually tailored personal development programme for young people aged between 13 and 25. It combines one-to-one support and group activities, delivered by a dedicated team in Prince's Trust Centres around the UK.